You can have as many milk trackers as you wish, provided you have either a unique set of sales / purchase accounts setup or multi-farm enabled. In your main Operations tab, hit Add new tracker and on the following page select Milk from the list provided. To create a new milk tracker, you'll need to enter a name and the milk company that you provide milk to. On creating you'll be taken to the milk tracker settings page, you can get back to this page at any time by going to Production > Milk tracker > Tracker settings. 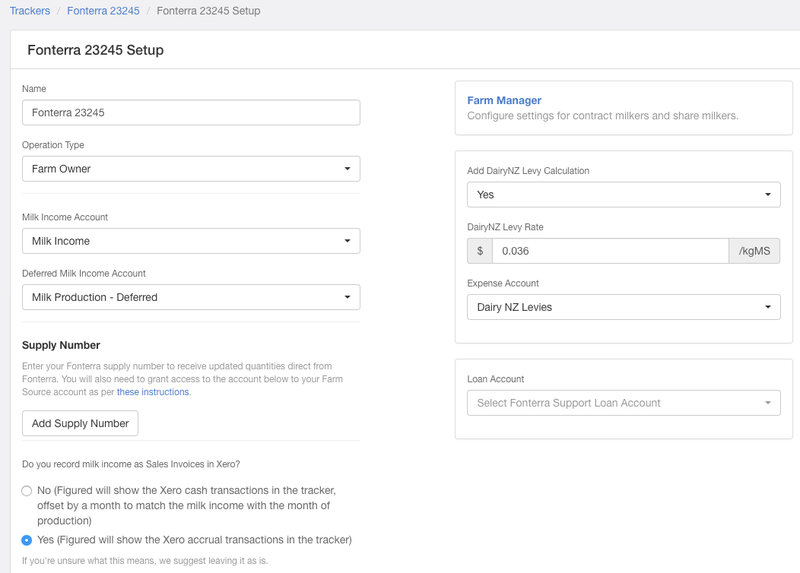 Here you can update the operation type, Xero account mapping, levies, farm manager settings, loan account, supply number (Fonterra NZ farmers only), and how you record your milk income in Xero. NOTE: Only New Zealand milk trackers will have an option to add a deferred milk income account, and map levies & loan accounts. The operation type defaults to farm owner but this can be changed this to share milker or contract milker depending on your farming operation. Selecting farm owner gives you the option to add add either a share or contract milker via the Farm Manger settings. In Figured you will need only two main milk income accounts (or one if you are an Australian farmer). These accounts are this season income and deferred season income. If you're a New Zealand farmer you can select to automatically calculated the Dairy NZ levies based on your budgeted milk production each month. If you select yes, you'll need to map a levies account. If you're a New Zealand Fonterra supplier, you can select to setup live Fonterra feeds which will bring in your kgMS produced each month. Check out how to do that here. If you're a farm owner you can select to add a share or contract milker, check out how to do that here. To make sure actual payments are shown in the tracker correctly, you need to select the cash / accrual mode in your milk tracker. If you cash code payments in Xero select No, but if you record them as sales invoices then select Yes. If you're a New Zealand Fonterra supplier, you can select to map your Fonterra loan account so that'll automatically associated with your milk tracker. Once you're happy with your setup, you can hit save changes at the bottom of the milk tracker.